Making ‘cents’ of money! A life skill made fun! k – 3rd grade 2 – 4 players. Money Mountain is an educational money board game. Two winners! The first to cross the finish line and who has the most money when the game is over! Navigate the board, pay your bills, hope to avoid the detours, and answer money word problems correctly to receive a bonus! Have fun will learning about money! Making ‘cents’ of money! A life skill made fun! k – 3rd grade 2 – 4 players. 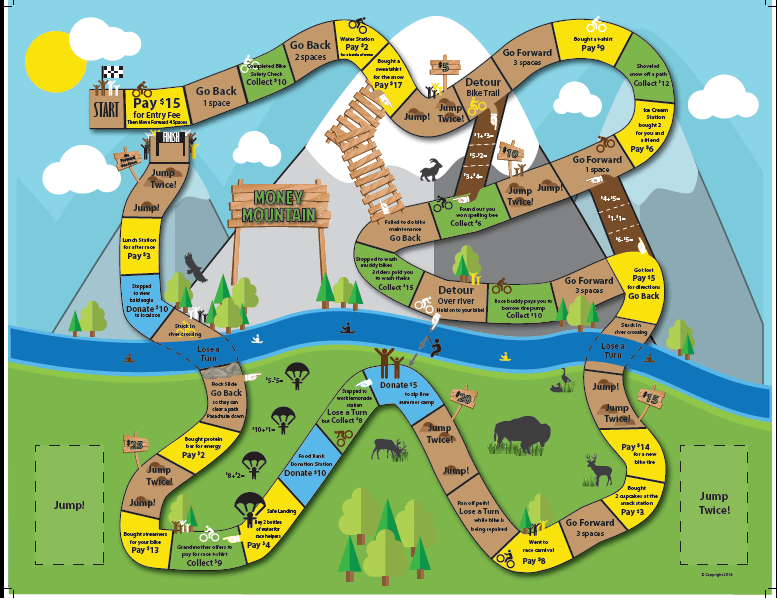 Money Mountain is an educational money board game. Two winners! The first to cross the finish line and who has the most money when the game is over! Navigate the board, pay your bills, hope to avoid the detours, and answer money word problems correctly to receive a bonus! Have fun will learning about money! This game is intended to be used/ bought with Key to the Front Door. The money, pawns and dice for this game come from Key to the Front Door.